A detailed discrimination of the Puff-balls is hardly necessary here, and I will therefore omit it. While I am not inclined to go so far as to contend, as was the quaint habit of old Dr. Culpeper, in his Herbal, in which he was wont similarly to elude description of an herb, affirming that "he were a fool indeed who does not know this plant" - or words of similar import - it is perfectly safe to say that if there is one fungus more than another with which the populace is specifically familiar it is the Puff-ball. The group opposite represents three species. The largest, Lycoperdon giganteum; the pear-shaped, Lycoperdon gemmatum; and the small, round Lycoperdon saccatum. L. giganteum. The largest species. Diameter ten to twenty-five inches; often more spreading in shape than specimen shown; surface smooth; stem hardly apparent; color dingy white in the edible state, at which time the solid flesh is also white. Spore dust, at maturity, yellowish brown. Grows in fields and pastures. L. gemmatum. Stem prolonged and tapering from above, suggesting the specific name pear-shaped; color dingy white; surface covered with deciduous warts; substance, young state, white; spore dust brown; height two to three inches. L. saccatum. Stemless; white; setting close to the ground; one to two inches in diameter; surface covered with loose, warty granules; substance, young state, white; spore dust brown. These and all other Puff-balls are edible in the young condition when the pulp is white. Plate XXXIV. Lycoperdon Giganteum. Lycoperdon Gemmatum. Lycoperdon Saccatum. In these fungi, of which there are many species, the spores are incased within the white or dingy peridium or more or less globular case - gasteromy-ceteae, from gaster, a stomach. The interior spore substance is at first white and firm in structure, at length peppered with gray, both conditions being indicated in accompanying cut, and ultimately black or brown, after which the outer case becomes dry and papery, and soon bursts at the summit, liberating its clouds of spores with the slightest zephyr, or, later, becoming dislodged from its slender anchorage to the soil, is whisked before the breeze enveloped in its spore-smoke. Fries, the eminent fungol-ogist, has reckoned the number of these spores in a single Puff-ball at ten millions - presumably a conservative estimate. But it will surprise most people to know that the plebeian Puff-ball of our pastures is good for something besides the kick of the small boy. There are a number of species of the Puff-ball, and none of them is known to be poisonous. 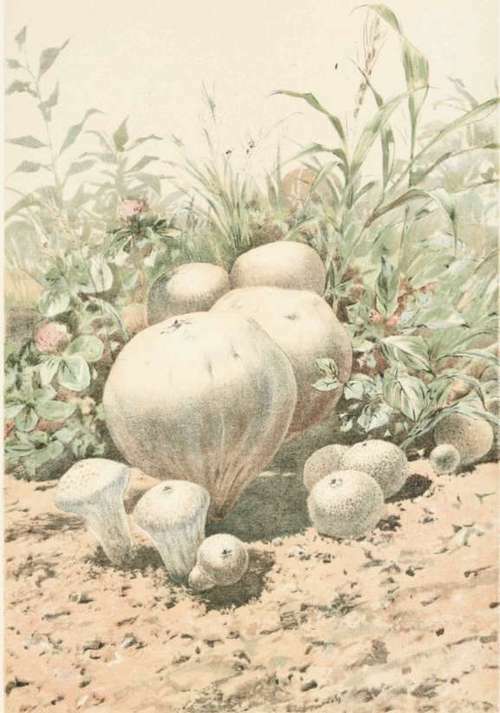 I have indicated an arbitrary group in Plate 34 ranging in shape and size from the small white globular variety of an inch in diameter, Lycoperdon saccatum, and the pear-shaped Lycoperdon gemmatum, to the giant pasture species, which may frequently attain the dimensions of a foot-ball or a bushel basket. In its larger dimensions it is more spreading in shape, being somewhat wider than high. All the Puff-balls are edible if gathered at the white stage - i.e., white pulp; those of yellow or darker fracture being excluded, as the fungus in this later stage is not considered fit for food. Of the esculent qualities of the larger species, Lyco-perdou giganteum, we may judge from the statement of a connoisseur: "Sliced and seasoned in butter and salt, and fried in the pan, no French omelette is half as good in richness and delicacy of flavor." M. c. Cooke, the British authority, says of it: "In its young and pulpy condition it is excellent eating, and indeed has but few competitors for the place of honor at the table." Other epicurean suggestions will be found in a later page. Occasionally in its plenitude, especially during August and September, single clusters will be found which would afford a meal for a large family. Other species, more or less frequent, are the Lycoperdon separans, whose outer epidermis cracks off in flakes at maturity; Lycoperdon cyathiforme, or cup-shaped Lycoper-don, a large species with distinctly purplish smoke so familiar to us all, the final cup-shaped remnant of its case having suggested its name. The larger specimens will be found the more fully flavored. There is but one danger which would seem to be possible with reference to the use of the Puff-ball as food within the restrictions already given, and that is, the remote contingency - assumable only on the supposition of most careless observation - of confounding the white ball with the globular condition of the Amanita (see Plate 2, fig. 1), or other fungi of the same deadly group, which are similarly enclosed in a spherical volva in their early stages. But inasmuch as this spherical period of the Amanita is usually spent underground and out of sight, and the merest glance at its contents would at once reveal the folded form of the enclosed mushroom, it would hardly seem necessary to warn the intelligent reader. But "once warned, twice armed;" and for absolute safety the tyro would do well to open every specimen, and be sure of its even, white, homogeneous substance before turning it over to the cook.